When going away camping as a family we really do seem to take a lot of gear. Though we have attempted to downsize or minimalise our gear, somehow, the back of the car always is completely full. Whilst we do manage to get the gear in, I have to say, that at times, our gear hasn't always been stowed as safely as I would like. We wrote an entire story for beginners about packing your car for camping - and when you read it, you will notice we mention the importance of safety in a car as being paramount to any trip. If you haven't read this story, read it here. Why is important to stow your gear correctly? Unrestrained goods anywhere in the car, can become deadly missiles in the event of an accident, and an object that weighs, say 2kg in a 50kmh accident, becomes the equivalent weight of 80kg. 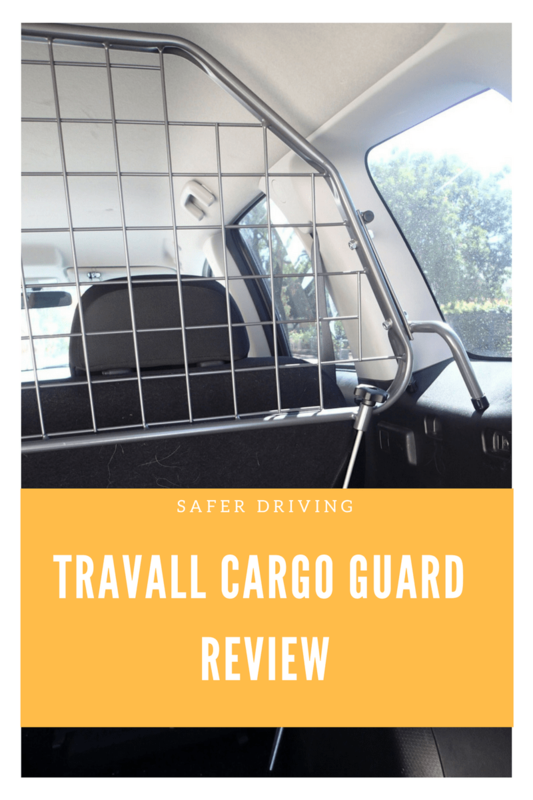 ​Travall supplied to us a Travall Guard - which is a cargo guard, specific to your car make and model for us to review and see what we thought of this removable guard. Want to know what we thought? As this product has not yet been tested to Australian Standard 4034.2:2008 it is not suitable for the restraint of heavy cargo. This product is not designed to compete with permanently installed barriers. 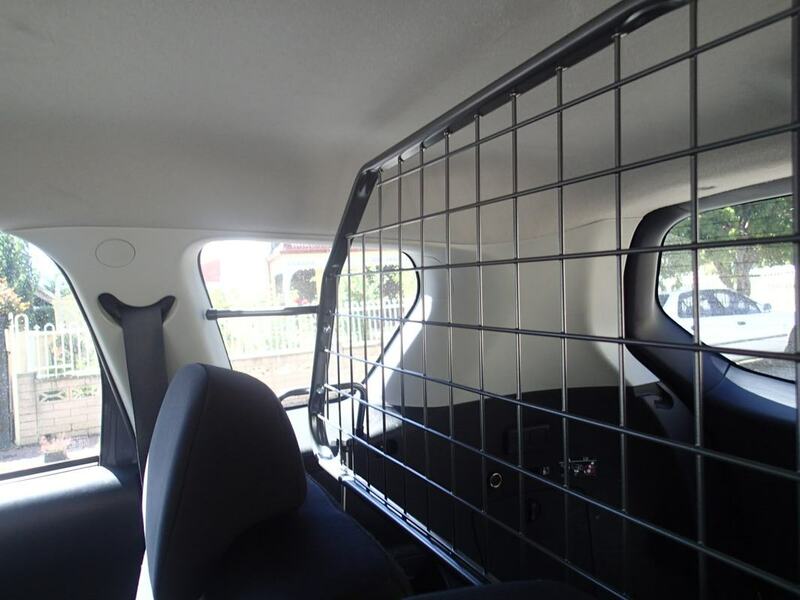 It offers an alternative to those who want to transport a dog securely to the rear of the vehicle, but do not want to have to make permanent modifications to the vehicle in order to achieve this. 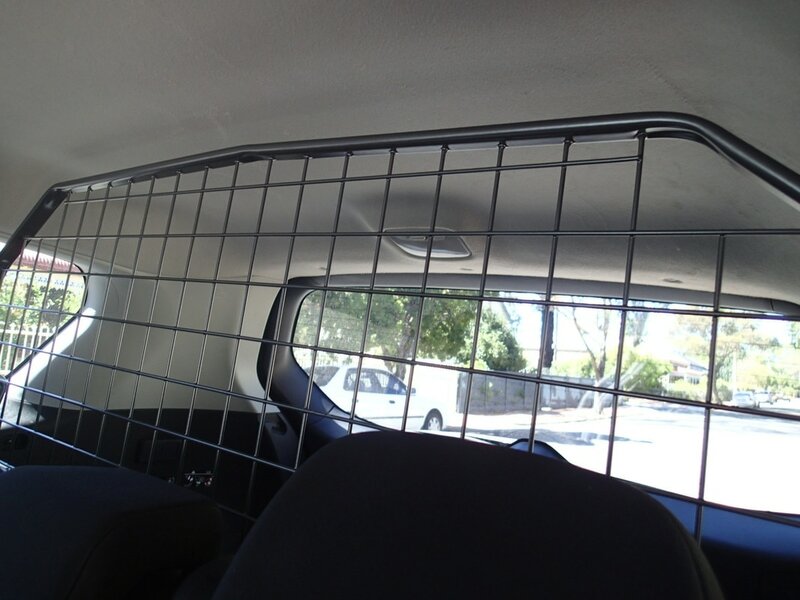 Travall are an international company, so have been using the terms cargo barrier and pet barrier because these terms are used widely throughout the rest of the world. Travall realize that this may cause some confusion for Australian customers. The terminology used on their web site and accompanying copy will be updated today so that Australians have clarity around what they are purchasing. The product will be referred to as a guard and a cargo barrier alternative. Note: This review has been updated to reflect that this is a guard not a barrier. 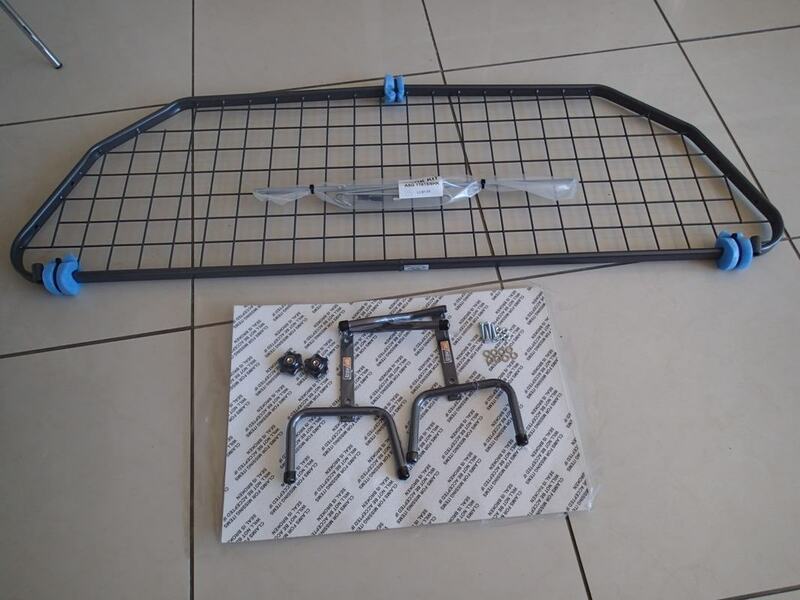 First up, the most important thing you need to know when ordering a Travall Guard, is you need to know the make and model of your car, and give the right information at time of ordering. The Guard comes in many varieties based on your car. So if you give the wrong information, then the barrier won't suit. All of this is pretty simple stuff to know (or find out), and it's about getting the right guard! There is a step-by-step guide on the website, to help you through this process. Putting the Guard together is easy. The front page of instructions (visuals only) was simplistic and gave you enough information to get all the right bits in the right places. The Guard is made of steel, coloured grey, and it's surprisingly light to carry (and assemble). There is a Universal Hook Kit that comes with the Guard - its like the anchor from the Guard itself to the boot. Crucial part of the set-up but probably the easiest. Getting the Guard in the car itself, was a bit more work, and we have shown in pictures below what it looked like. ​As you can see from the photos, the car is not pristine in cleanliness, and not sitting in some showroom!! It's the family car, covered in Golden Retriever fur and dirt from a camping trip. Our messy car, before the cargo guard goes in. I know, it really needs a vacuum. 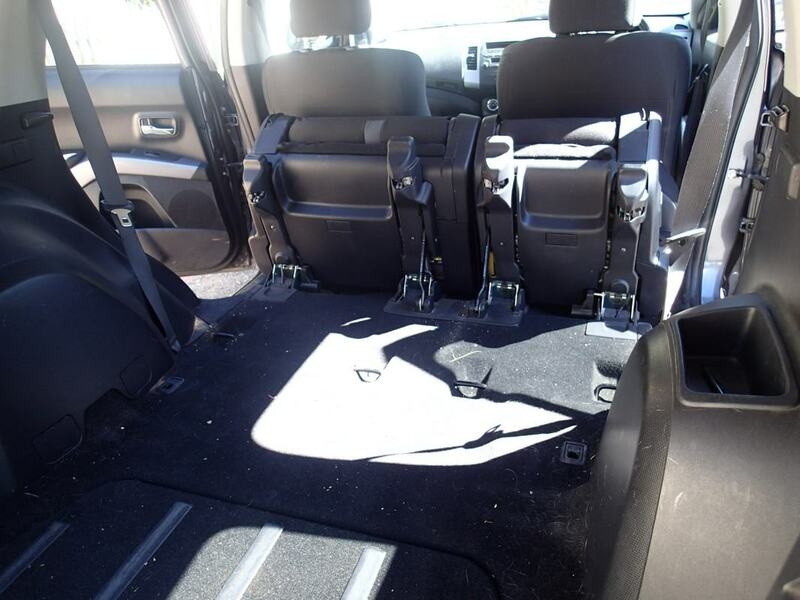 Put the rear seats down before you go any further with installation. Car still needs vacuum at this point. The above photos shows the Guard has been put in place with the universal hook running down to the floor. The Guard has been put in position, with the seats returned to their correct location. 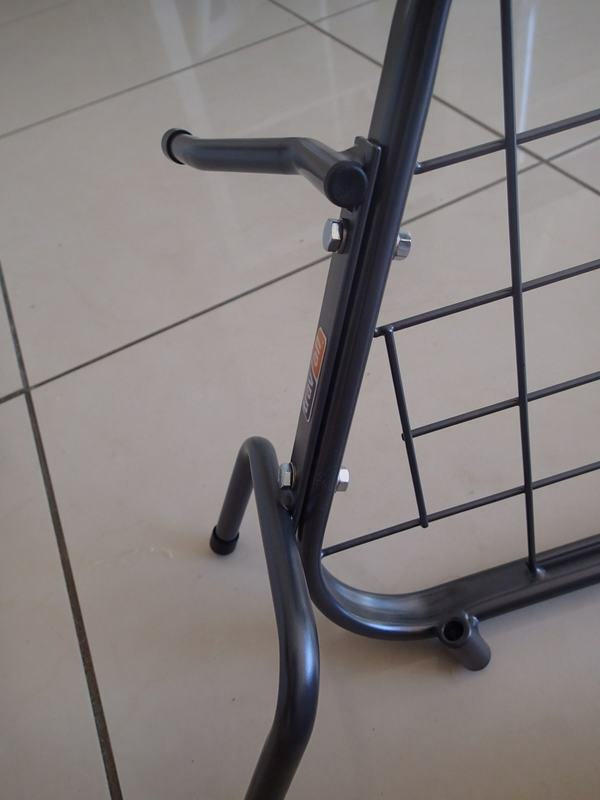 This screw top mechanism is one of the easy ways you can uninstall the Guard. It holds the hook tightly in place. 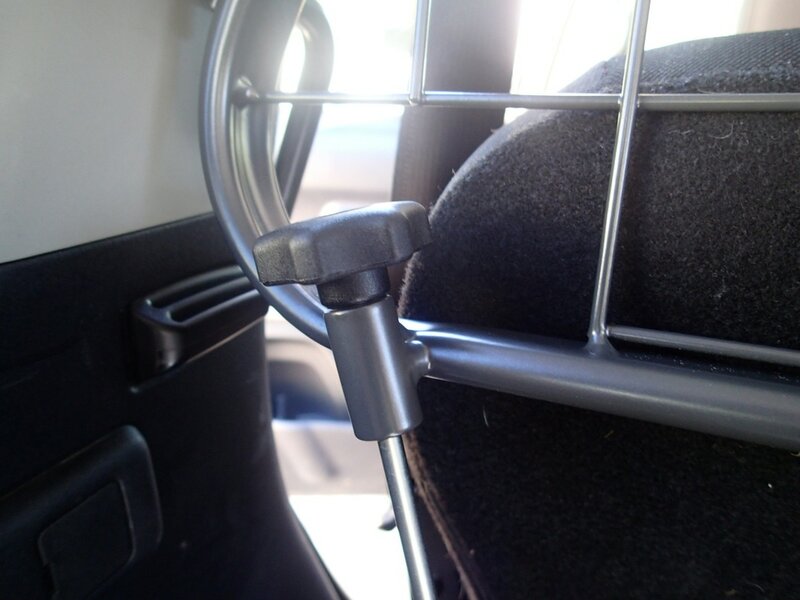 The bottom of the hook, attaches to the car anchors (already there) - all of this helps hold the guard in place. Easy to put together and install. We did install it a bit incorrectly in the beginning but we were trying to install based on photos in the instructions which were a little vague. Installation time - about 15 minutes. We took a bit longer, as we did something wrong, but then we had a lightbulb moment, and realised our mistake and it won't happen again! It's very simple to remove if you don't want it in for every trip. 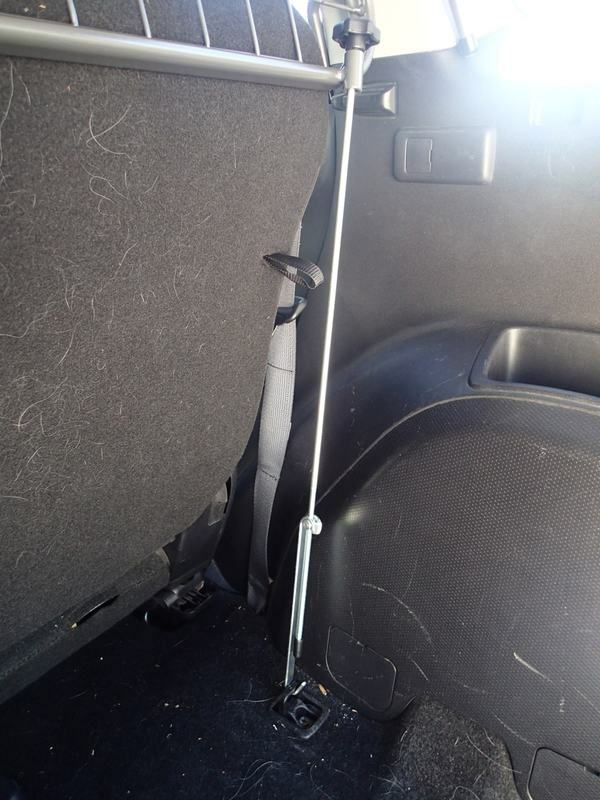 I have left the Guard in my car, despite not going on a trip, because it fits in so well, and you forget it's there until the time comes when you try to throw something over the back seat into the boot, and it bounces back at you. Having a non permanent cargo guard is important. Should we require, the guard can be taken down/out rapidly, without any tools required. 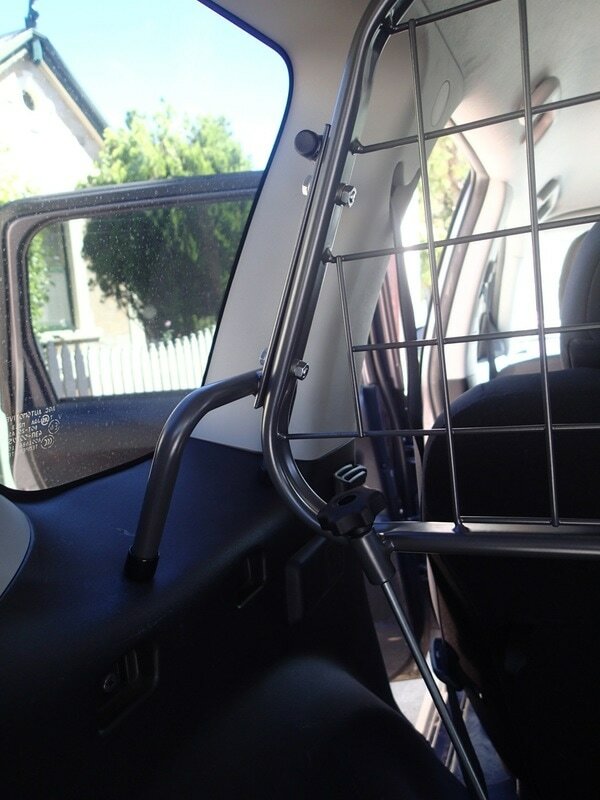 You do feel safer with a lot of gear in the car, and if you had a pet that you transported, that pet is safe in the rear, and not trying to get over any seats. For those of you travelling with a dog, this might be the way to go. The Guard required no modification to our car, and didn't need any tools or mechanical knowledge. That's a big plus for me. We were very impressed, so it's hard to find fault. ​The guard was perfect for our vehicle (giving the right details at the start is key), and it does look good in the car. Not obtrusive. We haven't put ourselves in an accident to test gear or groceries or pets flying around in the car, and don't intend to anytime soon, but I feel a lot more confident knowing that we have a barrier. Rookie Mistake: When installing, we inadvertently had our rear seats pulled forward quite a bit, towards the front of the car. After installation of the guard, we were surprised that there was quite a gap between the rear seats and the Guard. We couldn't work out why there was this gap, and thought it was "lost" space for gear. And then it clicked with us! The rear seats had been positioned in such a way to maximise space for a bike, and never returned to their actual, more comfortable (eg. greater leg room) location. No wonder the kids were always squashed. Fixed that, and everything was right with the Guard and the seats. Prices are around $215-245 dependent upon the make/model of your car. You can see the range at the website. Our Guard was shipped from the UK, and it took about 3-4 days to arrive, which is pretty impressive, as I have had goods that come from Melbourne to Adelaide that take weeks!! So I was incredibly impressed by the speed of delivery. Now that we have a guard , it really does bring peace of mind. Something like the Travall Guard is so simple but very effective. 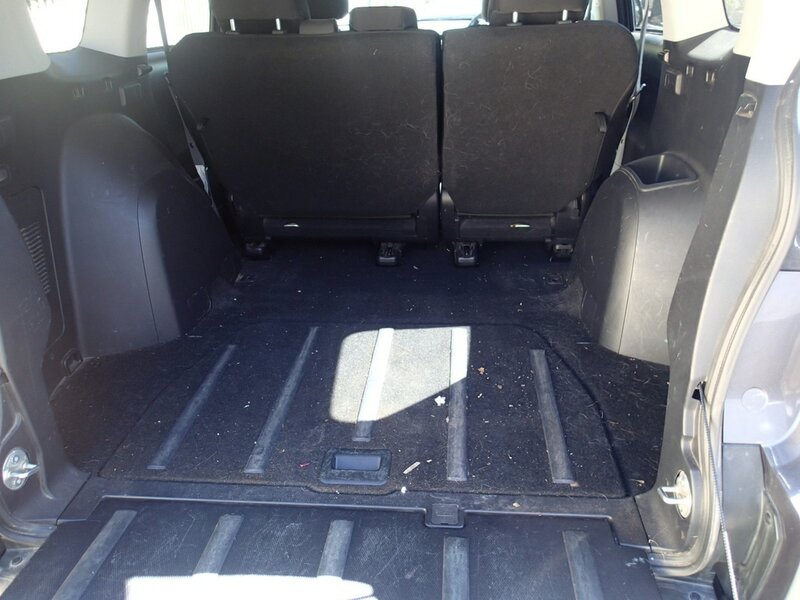 If you do any travelling and carry gear in the back of your car, without a guard it might be something you wish to investigate for yourself. 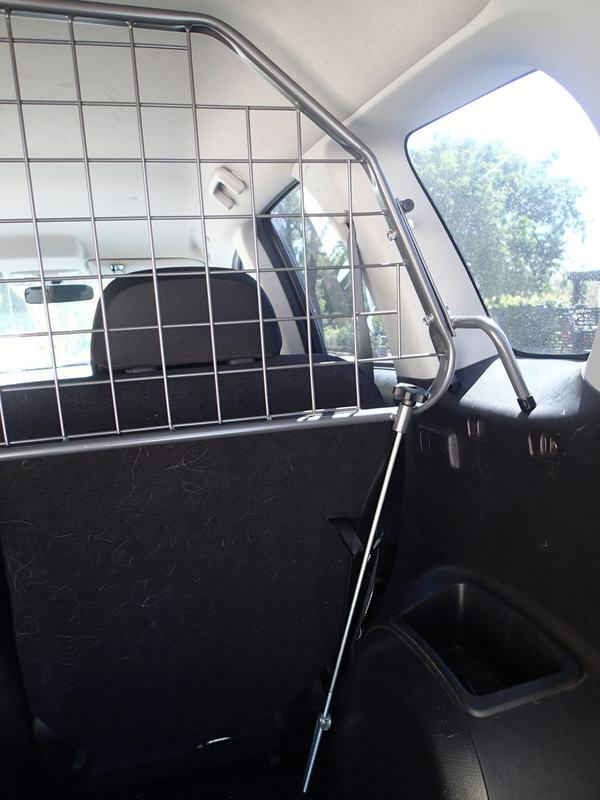 NOTE: Heavy gear should not be carried in your car with this Guard until Australian Standards are met. As always, we encourage you to make your own investigation about the suitability of this product for you. Cost wise - I think its very reasonably priced. This item was provided to Go Camping Australia for the purpose of this review. For further information about our Product Reviews disclosure policy, we encourage you to read here.